Bayer Landscape Architecture is working as part of a design team to develop a new vision for the north terrace of the Rundel Library in Rochester, New York. The iconic building sits atop many layers of Rochester’s history. The library was constructed in the mid-1930’s along the east side of the Genesee River above a segment of a historic raceway and the now abandoned Rochester Subway tunnel. The subway was routed through the historic Erie Canal aqueduct that crossed the river at this location. The library’s north terrace was recently closed off for safety reasons, and the City of Rochester is seeking to bring this terrace back to life. 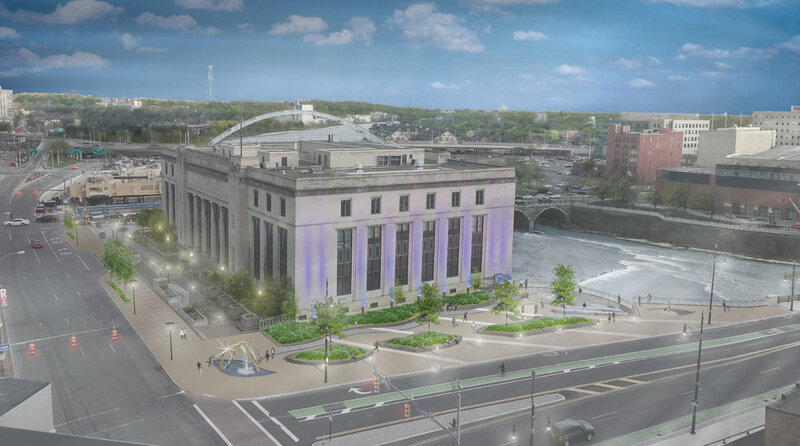 Bayer, along with the design team and city staff, have developed concepts for the north terrace that draw from the site's rich history, its connection to the river, and the civic, intellectual and architectural significance of the Rundel Library. The terrace will have a fresh and exciting new look while simultaneously showcasing the city’s past. The design will highlight historical elements by providing views to the remnants of the Erie Canal aqueduct, subway tunnel, and the Johnson-Seymour Millrace. It will also include a dramatic river overlook, public art, a water feature, gathering spaces, as well as improved sidewalks along South Avenue. The project is an integral part of "ROC the Riverway," a tranformational new vision for downtown Rochester. Copyright © 2019, Bayer Landscape Architecture, PLLC. All rights reserved.